In addition to providing comprehensive art transportation services, Fine Art Shippers also has extensive experience in art consulting. We can help collectors choose the right art pieces, organize gallery exhibitions for emerging artists, assist with selling fine art at auctions, and provide a whole range of other important services. Moreover, since our art transportation services are not limited to the United States only, and we successfully operate worldwide thanks to our reliable international partners and agents, our team can solve any art-related problem in almost any country around the globe. For example, Fine Art Shippers works with many artists, galleries, and collectors in Australia, for whom we handle and ship art all the time. Besides, we are always pleased to meet new talents, and Susan Willemse is definitely one of them! Susan Willemse is a contemporary Australian artist known for a series of beautiful paintings of Australian birds. Her amazing works made using airbrush and acrylics on stretched canvas are inspired by nature and photography that has long been a favorite hobby of Susan and her no less talented husband Steven Willemse. 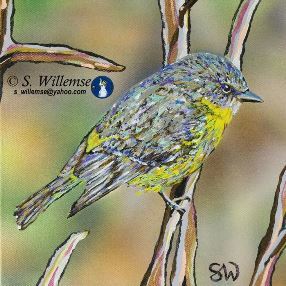 Cockatiels, cockatoos, ducks, cormorants, emus, eastern rosellas, brown falcons, galahs, swans, egrets, and many other Australian birds – all can be found in paintings by Susan Willemse. Highly recommended! At Fine Art Shippers, we love works by Susan Willemse, and we would be happy to provide this talented artist with our art transportation services, shipping her fantastic paintings from Australia to anywhere in the world!